Tyler Copley has made waves in his life and made many friends. We are all thinking about him and his family and praying for this Very Special Young Man! As we journey through life, some people and situations cross our paths and form permanent memories. Such a person is 19 year old Tyler Copley who is in the last stages of a valiant struggle with cancer. Tyler and his family live in Cobb County, Georgia. He is a former 6th Grade Student of our daughter, Jennifer Dawson, who teaches sixth grade social studies at Lost Mountain Middle School near Kennesaw in Cobb County.As teacher and student, they became very close friends.Tyler attended some of the Teacher of the Year activities for Jennifer. Through Jennifer, Betty and I have followed Tyler’s progress and setbacks. He is a special person in Jennifer’s life and ours. He has also endeared himself to countless others with his winsome personality and determined attitude to get all he can out of life, not matter how short. Tyler’s mother and father have faithfully stood by Tyler. Tyler had a Caring Bridge website when he was hospitalized for long periods and many folks followed his progress including us. Tyler now has a prosthesis for his left leg. 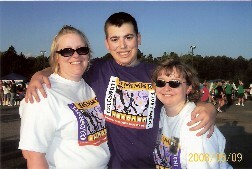 However, he continued to be active and determined to enjoy life.He participated in the May 2008 Cobb Relay for Life. Tyler was recently highlighted in an Atlanta Journal-Constitution Article on his struggle and current state.That inspiring article appears below. 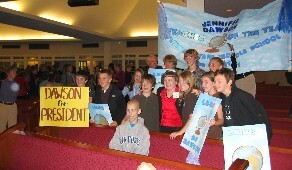 Tyler Copley was front and center at a TOY Pep Rally for Jennifer Dawson on October 26, 2006. Connie Copley grabs onto her son, Tyler, as he struggles to walk a task that requires more and more effort with each passing day since Tyler's cancer metastasized in his lungs. Connie Copley laughs as her son Tyler jokes with his oncologist of seven years, Dr. Bradley George. Connie Copley rubs her son's leg while a preacher prays for God's peace to surround their home. The preacher keeps praying, and Connie keeps rubbing, moving from Tyler's aching leg to his aching back. "You were killing my leg, Mom," Tyler says. "Sorry," she says, kissing her boy on his forehead. A registered nurse turned stay-at-home mom, Connie Copley has combined her two chosen professions into the most heartbreaking job: stay-at-home nurse. Her patient is her 19-year-old son. He is dying from Ewing's Sarcoma, a rare form of juvenile cancer he has battled since he was 12. And though Tyler has hospice nurses now, the job of primary caregiver can't be taken from Connie any more than can the job of being his mom. "We have a saying around here," Connie says. "There's Mama, then there's Not Mama. Everyone else is Not Mama." For seven years, Connie and her husband, Todd, have supported their boy while coming to grips with what the future might hold. For the past seven weeks, they've lived with the future they feared: Tyler's time is short. Through it all, Connie has been the calm in the storm, the one who isn't rattled when Tyler gasps for air or spits up blood. But who can blame a mother for refusing to accept the worst? On this day, the Rev. Jim Higgins is in the Copleys' home in Acworth to help Connie take the next step in a journey no parent should have to make. Tyler's dad is here, too. But it is Mom whom Tyler watches closely. How she handles this moment will tell him something. She doesn't want to let him down. When the shades are shut in Room 181 of the Aflac Cancer Center at Children's Healthcare of Atlanta, it doesn't matter how sunny the skies are on the other side of the window. In here it's dark, jarringly dark. Just 24 hours earlier, Connie thought her son was as strong as she'd seen him in months. Now she fears this is his last day. Tyler's cancer, which typically attacks an adolescent's pelvis, shoulder or leg and then often spreads to other parts of the body, had metastasized into his lungs this spring. It was his third relapse, and everyone agreed it was time to stop fighting. Doctors didn't know exactly how much time Tyler had left, but it wouldn't be measured in years. Tyler didn't want to lie in bed feeling sorry for himself. That's not Tyler. A fast-talking jokester, he wanted to keep living life as long as he could. Over the past several months, Tyler scratched a lot off his "bucket list." He graduated from high school, enrolled in college and started training for a triathlon. He got a matching tattoo with his dad and had his head shaved. "His mother despises it because it is such a reminder of his cancer," barber Shannen Smith said of the shave. "We waited till after hours and I did it. Tyler is going to get his way till his last breath." On June 18, Tyler starts coughing up blood from his lungs. The pain in his back and chest worsens. Tyler tells his parents to call 911. He thinks of the living will he had signed. It says doctors should not insert a tube to help him breathe, but now his resolve not to be intubated is weakening. "Find those papers," Tyler tells his mom. "Tell them they can intubate me if they need to drain my lungs." In the emergency room, Connie tells the oncologist about Tyler's advance directive. She is having second thoughts; she doesn't know what to do. "I won't make you make that decision," the doctor says. "I will. We won't intubate." Connie is relieved. She knows this is how Tyler really wants it. Tyler makes it through the night. But by 10 a.m. the next day, Connie is calling her husband back to the hospital. Tyler's breathing is labored. He can barely speak. Until test results come back, doctors can't say how much internal bleeding Tyler has suffered. Bleeding into his lungs, the family learns, is one of the ways he might die. Finally, word comes that Tyler has experienced oxygen starvation, which is another way he might die. Usually kids with Ewing's get progressively short of breath as the tumor invades more of the normal lung. The oxygen level in their blood drops. "They usually become more sleepy and less aware of what's going on around them — and we think they are less aware of what's happening to them," says Tyler's doctor, Bradley George. "It can be tough for parents and families — and their doctors — to watch as the kids are working hard to breathe." Tyler receives a morphine and albuterol breathing treatment. And he does a 180. Soon he is joking again, texting friends, frustrating doctors and nurses. "Can I trade you in for someone else?" he asks the head nurse. He has a captive audience and re-tells a story of receiving a phone call from President Bush a few weeks ago. Then he describes a practical joke war he's had with his brother, Kirk. Laughter fills what was, only hours earlier, the most somber of rooms. But the joy is tempered with this: Connie Copley listens as hospice nurses tell her son they will be at his house before nightfall. On the outside, Connie looks calm, confident. "On the inside," she says, "I'm falling apart." The worst moment didn't come seven years ago, when the family learned of Tyler's cancer. The worst came when the cancer returned four years ago. Connie knew only about 5 percent of Ewing's kids survive a relapse. "It was 100 times worse, getting that call," Connie says. "There were times when I couldn't drive because every time I was alone in the car, I was crying." A year ago, she had to make peace with another reality: Tyler turned 18, and Connie and Todd could no longer force him to endure treatments he didn't want. Nine months ago, he chose to have his left leg amputated in a desperate attempt to rid his body of the cancer. Acceptance has not come easy. "I've never been totally accepting," Connie says. "We went to the lake with some friends and there was a nice church service with all the boats one Sunday morning. Someone sang 'It is Well With My Soul.' I fell apart. It is not all well with my soul. I'm not ready for this. I know I am not there and may never be. "But six months into his first treatment, I remember thinking there's only so much you can do. It is not my will, it's not what I want, but it is for a purpose. I gave that up a long time ago, having control." Connie takes things one day at a time. That means she can go all out today, then wake up to face another today. And, if she's lucky, another. The Monday evening routine at the Copley house was always rushed, even in the best of times. No one would mistake these for the best of times. It has been only four days since Tyler's emergency room scare. Todd Copley has just gotten home from Dobbins Air Reserve Base in Marietta, where he's a navigator. Connie has just dropped off Tyler, whom she'd driven around on a handful of errands, and now must leave to pick up daughter Sarah, 12, at a friend's home. Middle child Kirk, 15, is lying on the couch watching TV. Tyler heads to his room and plops down on his bed. The next 30 minutes are harried. "Dad, I need ... the oxygen mask ... now," Tyler says in a loud whisper. Connie pulls into the basement garage with Sarah, who has 12 minutes to change into her dance leotards, eat dinner, put her hair up and be out of the house for her lessons. "Tyler! Tyler!" Connie says, walking into his room. She's concerned and compassionate, but not panicked. "Does it just hurt, Tyler? Do you need to cough?" Tyler grunts and starts coughing into a bedpan. "Todd, get the mashed potatoes, put 'em in the Tupperware," Connie calls from Tyler's bedside. "Sarah's got to go." Todd needs to take Kirk to Boy Scouts. Nothing is effortless for Connie, and that includes refraining from breaking down in front of others. If there is one trait that comes naturally to Connie, it is her calm. "Oh, my kids hated it that I wasn't the mom who freaked out every time they got a little cut or bump or bruise," Connie says, sitting at the end of a physical therapy table one afternoon, rubbing Tyler's remaining foot. She throws a glance at Tyler. "You'd freak out if I freaked out. So I've got to stay calm. It's good that I'm not the freaking-out mom, right? That's good Tyler, right?" "It just feels really good to have your foot rubbed," Connie says, explaining the medical benefits of what she is doing while they await Tyler's therapist. "Rub my thigh," Tyler says, pulling the oxygen mask from his face to make the request. "Get me another pillow, please," Tyler says. Connie obliges each request without hesitation. Knowing she has done everything she can for Tyler will help her in the future. "Maybe because I was a nurse, I know too much," she says. So sometimes, she protects her husband. "I see some things, like Tyler's motor skills not being as good as they were, and I know that's not good. But Todd doesn't need to hear about that." What she wants in return is for Todd to not talk about the future too much — especially about things like where Tyler will be buried. "I'm sure Tyler has an opinion on that," she says. "He'll bring it up when he's ready. I'm not ready." Connie and Todd were married 21 years ago, and with Todd in the Air Force they've lived in Arizona, California, Germany, Arkansas and now Georgia. In Arizona, Connie worked at a hospital in orthopedic neurology. Later, she took a job as a nurse in an eye surgery center. When they moved to Germany, she stayed home and has not worked out of the house since. "Will you grill me a Vidalia onion when we get home?" Tyler asks, feeling a little better, still waiting on his physical therapist. "Just remember. Because I might forget." It is mid-July. Time for Connie to take another step. Higgins, the family's pastor from McEachern United Methodist Church, helps her, Todd and Tyler plan a funeral. Tyler had brought it up, just as Connie knew he would. Higgins starts: "This is about you," he tells Tyler, "but it's for them." Tyler likes the sound of that. "Tell us the things that are important to you now, and we'll try to do everything we can," Connie says to her son. Tyler wants music that is "different, like me." He wants a tree planted with a memorial stone under it. And what if he wants to be buried in his home state of Ohio? Can he do that and have a service here? "We can do a graveside service there," his mother tells him. Connie can hardly believe she is planning her son's funeral without falling apart. She has an overwhelming sense of being held up by God. Connie's faith has been challenged and has grown because of Tyler. She doesn't pretend to understand the whys; she doesn't even want to. But she believes in the goodness of God and that one day, she'll see her son again. At this moment, she wants Tyler to finally have some sense of control. "You think about it all," she tells Tyler. "We'll talk about it, and I'll write it all down." Then she starts to rub her son's back, knowing how important this meeting has been — for everyone.